The exchange between Mitt Romney and Associated Press reporter Glen Johnson yesterday provides an interesting glimpse into everyday media relations. It’s being covered from several angles, but not so much from a communication perspective, where my interest resides. Here is a quick link to the video of the exchange from CBS News’ Scott Conroy. At a press conference inside Staples in Columbia, South Carolina, Romney was delivering a point that his campaign team has identified as one of several contrasts between himself and other candidates. It’s one of the most challenging points to successfully deliver in any campaign, primarily because all candidates speak with lobbyists at one time or another. Kaufman, chairman of Washington-based Dutko Worldwide, is a well-known lobbyist, and former advisor to President George H.W. Bush. He has been frequently seen on the road with Romney during the campaign, purportedly as an unpaid advisor who is not privy to senior strategy meetings for the campaign. "Did you hear what I said? Did you hear what I said, Glen?” Romney continued. “I said I don't have lobbyists running my campaign, and he's not running my campaign." "So Ron's just there, window dressing; he's a potted plant," said Johnson. The comment is a form of an aggressive reporting style, identifiable as needling. Needling is the patented rejection of whatever the speaker says (eg. “Oh, come on now, you don’t really believe that, do you?”) In this case, despite Romney delivering a not great, but fair answer to draw a distinction, Johnson continued to push his own definition of having lobbyists tied to the campaign. I’ve never been a big fan of needling, but it exists. So rather than bemoan the interview tactic, it’s better to prepare clients for the eventuality that it will happen because it will happen sooner or later. Romney would have been better off restating the distinction to the audience (as opposed to engaging Johnson direct) and then defusing the situation by offering to show Johnson his campaign’s organization chart (which he did anyway, but by then it was too late). While it might not have changed Johnson’s argument, it could have minimized what’s become a heavily discussed story. Even more striking to me, despite receiving a little less attention, was the second, quieter exchange between Johnson and Eric Fehrnstrom, press secretary for Romney’s campaign. Fehrnstrom seems to push the limit in telling Johnson he was argumentative with the candidate and it was out of line. “Save your opinions and act professional,” Fehrnstrom said. Public relations practitioners are often put in a position where they might need to be firm, but it’s generally not a good idea to question a reporter’s professionalism. Why? Because even after the campaign attempted to mend fences with Johnson by showing him their organization chart, he published his evidence that lobbyists are an important part of the campaign. Besides, candidates, public relations professionals, and members of the media all have varied definitions of what professionalism means anyway. These differences are about as plain as what they are all wearing and where they are speaking from in the video. No comparisons are needed. Net sum: While there is enough difference between offering advice to a campaign and being a paid member of the campaign team to conclude that Romney wasn’t attempting to lie as some suggest, the net outcome is still a communication loss for Romney. Case in point: In delivering what was meant to be a contrast point between Romney and Senator John McCain, most members of the media reported the opposite, writing stories that deepen Romney’s ties to lobbyists as opposed to diminishing them. By any measure, that’s a tough luck outcome for what didn’t even add up to three minutes of tape. It's a tough business but I guess it's worth it for those who seek such political offices. I have a hard time believing much of what anyone on either side of the political aisle spews...but then again...apathy doesn't get one far either. I think needling in politics is akin to planted questioners and staged audiences. Fake and clearly not objective reporting. But then again, objectivity is a foreign concept these days! It is a tough business and I don't think most people believe what candidates say unless they're openly supporting them. When working on a campaign, it's hard enough to communicate the truth so why anyone bothers with half truths and untruths is beyond me. Though I do agree. 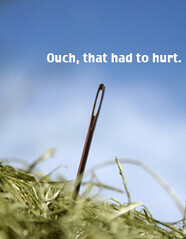 I'm not a big fan of needling either. Johnson had already predetermined his opinion on this subject. However, even though I don't like needling, he was well within his right to do it. I just read the LA Times piece on this and liked the roundup; there's something for everyone, which I took to mean that more people will find whatever they are looking for in this one. Here was my take on the reality (which moves a bit beyond communication): Romny overreached on the contrast point, but isn't a liar, and did 'okay' but not great on the rebut. Johnson is stretching the semantics, but was well within his right to refute the claim as a journalist. Fehrnstrom then made some high risk, low reward remarks that almost never end well, right or wrong. More to your point, I think objectivity flies out the window because most people look at the video and ask "who was right?" Polarizing the question like that leads nowhere because the answer is no one was really right or wrong. Or maybe everyone was wrong, at least a little bit. Great to see you comment on this one. Interesting analysis, Rich. I thought that that was a fellow reporter, someone with more experience, talking to Johnson afterward. I never would have believed that someone from a campaign would talk to a reporter like that. The Bush Whitehouse, maybe, but that's another story. I shouldn't think Romney is in a position to have his campaign act that heavy handed. I thought the same. It was rather abrasive on Fehrnstrom's part, especially considering the number of cameras present. As for your side point, some of the networks don't believe in pre-roll advertisements, precisely because of what you said. However, CBS recently started placing pre-rolls on everything, including show promos (if you can believe it), which basically means leading advertisements with advertisements. If it was not for the content of the video in this case and its importance to the post, I would not have linked to it. In my opinion, pre-rolls don't belong on short clips or promos. My best guess is CBS is still testing acceptable tolerances. Other networks are leaning toward other solutions, trying to find the right balance of content compensation. Sooner or later, they will get it right. Er, I hope.